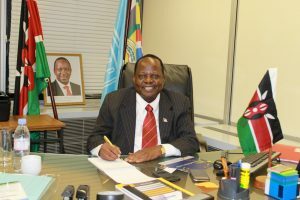 I am pleased to welcome you to the Website of the Permanent Delegation of the Republic of Kenya to UNESCO. The Website has been designed to provide you with comprehensive information about the activities of the Permanent Delegation of Kenya at the United Nations Educational, Scientific and Cultural Organization (UNESCO). You will be able to easily access recent statements and documents. It also contains links to the Websites of our closest collaborators. We shall update our Website regularly to ensure it provides useful and up-to-date insights and promote our cordial relations with UNESCO, and also that it enriches the public understanding of Kenya and UNESCO by providing you with more in-depth information on particular subjects. I hope you will find the website enjoyable and useful as you look for relative information. My staff and I will appreciate any comments and ideas that will enable us improve the quality and the information we provide in this Website.